During our residency we accumulated invaluable insights about Latvian belt making from two very nice people and experienced weavers, Lilija and Laima, who taught us two different techniques of belt weaving. You can read below about our meeting with Lilija, while the story of Laima will appear here also soon. We met Lilija in the morning at the Riga ArtSpace, where an exhibition on traditional Latvian crafts was taking place. The exhibition was a great surrounding for starting to learning about Latvian belts, as there were numerous examples of different areas and techniques. Language was also not an issue, as Lilija spoke excellent English. 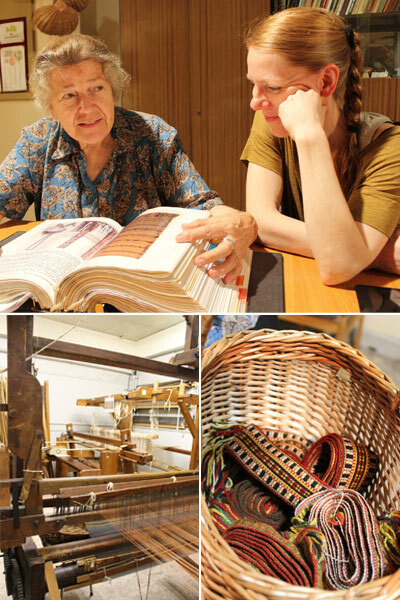 After the exhibition we went to Lilija’s guild weaving studio in the old town of Riga. As soon as we arrived to the studio filled with looms, Lilija pulled out baskets of woven belts, explaining us how each belt was different from the other in its pattern, construction and style. She also showed us tapestries that she had made by joining many belts together. Going deeper into the subject of belt weaving, we were getting more enthusiastic and interested! Lilija showed us also a manuscript of one of her books, where she had collected an impressive collection of Latvian belt patterns, including detailed tutorials on how to make them. She had drawn with great care instructional pictures of each belt pattern based on real belts and photographs. As she turned the pages of this incredible book, our interest was caught by an ancient weaving technique called card weaving or tablet weaving. Although we were getting some idea of how card weaving might work, we needed to try it out ourselves in order to get a better hands-on understanding of the technique. When we mentioned to Lilija that we would like to give the technique a try, we were amazed by her interest and energy to spend more time with us in order to show us how to weave using cards. After having some traditional Latvian food for lunch, we continued to Lilija’s home to learn more from our Master. Lilija has lot of experience in teaching belt weaving, so she knew immediately where to start with inexperienced beginners like us. We learned first how to prepare the yarns and the cards. Once our 16 card set up was ready, we began to weave. Proceeding step by step, we received several useful tips as well as printed instructions – and continued to be amazed by Lilija’s energy and dedication, as she patiently guided us. Below is a brief description of the steps involved in the card weaving technique as we learnt it from Lilija. For more references and explanations please refer to the resources page, and have also a look at how we have used this technique in making a Cosmic belt. Card weaving is a technique that uses a stack of cards as a loom through which long yarns are threaded. These warp yarns can be lifted or dropped by rotating the appropriate cards, usually by a quarter or half turn, after which the weft thread is passed through. Repeating this action weaves the belt and reveals the patterns. 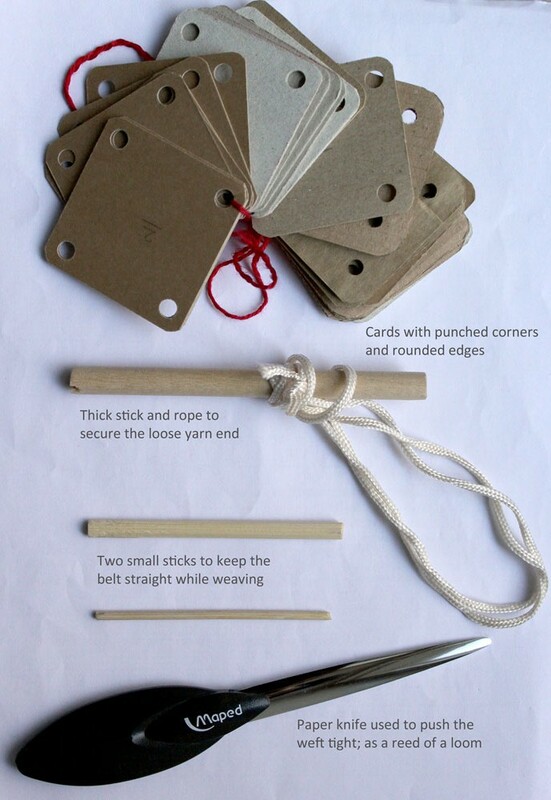 The tools needed for card weaving are easy to make using everyday materials. The cards can be made from old cardboard pieces by cutting the into palm-sized squares, and by punching holes in each corner. More complex patterns can also have hexagonal or other polygonally shaped cards. The loose ends of the yarns are knotted and secured around straight sticks – these could be anything from twigs to broken chopsticks. We learned two ways of making patterns, which differ regarding the rotation of the cards. Repetitive patterns can be woven by rotating all the cards simultaneously quarter of a turn in the same direction, and sliding the weft through after each turn. In this technique the pattern is based on how the yarns are threaded, as the rotation of all the cards remains the same. More complex patterns can be made by rotating the cards selectively and to a different degree according to the specific pattern in question. The selective rotations control which colours appear on the top and the bottom. The card weaving technique may sounds complex at first, but it can be learned rather quickly with a bit of practice and patience, as we experienced to our positive surprise. We recommend you to give it a try too! 4. Tie the cards together when done so they do not move around while you prepare the other parts for weaving. 5. Sort the loose ends of the yarns. One end is still tied so it is easier to work with. 6. Comb the threads if needed to separate each strand neatly. 7. Bunch-up all the loose ends and tie them around a small straight stick. Attach an extra piece of long strong thread to this stick. 8. This loop of strong thread is used to attach the yarns to a fixed spot like a door handle in your home while the other end is attached to a ribbon tied around your lower chest. 9. Another two sticks are inserted between the yarns to keep the belt straight and in good width while weaving. 10. The belt is woven by holding all the cards together between your fingers and by turning all of them together in one direction. This lifts the appropriate yarns and the warp yarn can then be inserted through. 11. Repeating this rotation of cards slowly but surely weaves the yarns and reveals the belt pattern! After exploring Riga, we traveled to our residency place, SERDE, which is located in Aizpute. Already the previous summer our host Signe had introduced us to local craft experts in this small town. This year we spent time with Laima, an extremely kind and helpful professional weaver. We started by making a visit to the local weaving studio where Laima usually works. Before diving into the details of belt-making, we got a chance to see some large-scale looms. We were particularly fascinated by an over hundred years old loom, which worked with punch cards – a technology, which inspired the early computers. Even though Krisjanis Sneiders did his best in translating Laima’s explanation to us, we did not understand exactly how this “wonder machine” worked, and Laima remained as the only one who could decipher its intricate mechanisms. What we did learn was that, although the punchcard loom could do many patterns, the amazing Lielvārde’s belt that we had sought out to investigate was too complex to make with it due to its numerous, changing patterns. So we moved on to understanding how such a belt could be made by hand using a technique which is called prievite stelles in Latvian, referring to a loom and a small belt. Laima had learned this band or backstrap weaving technique at elementary school in Vidzeme. The band weaving technique is similar to the card weaving technique that we learned from Lilija in the sense that both are portable weaving methods, where one end of the loom is tied around the weaver’s waist, and the other to a sturdy object like a door handle or a table leg. What is different, however, is the way of moving the warp yarns up and down in between passing the weft through. In card weaving this is done by turning the cards, while in the backstrap method a heddle is used. Also, when making a pattern, one needs to carefully lift on the top appropriate yarns for each row. The pattens on the Lielvārde’s belt are created this way by picking certain red yarns, while others remain on the bottom, resulting in a negative image of the pattern on the other side of the belt. The picture series below shows the steps involved in backstrap weaving. 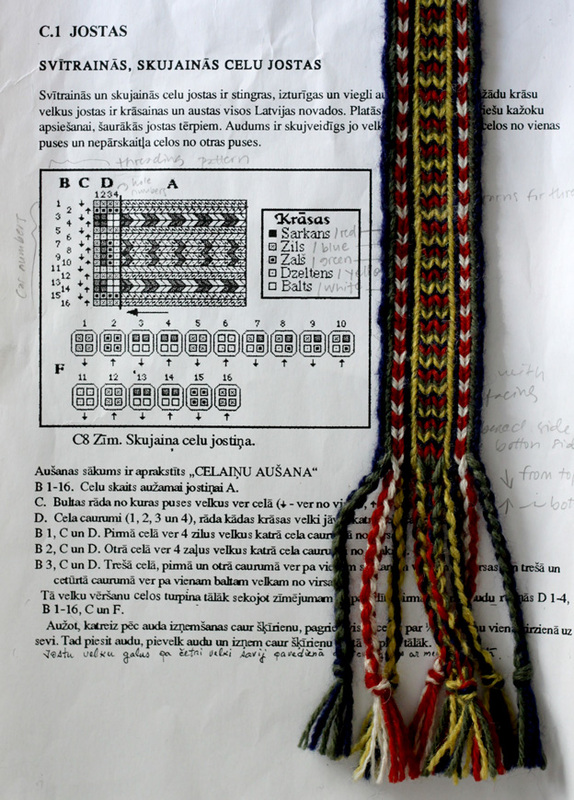 We began by selecting a pattern from Laima’s belt book, after which Laima showed us how to count the needed yarns from the pattern. Two different kinds of yarns are used in the Lielvārde’s belt: white ones of thin linen and colored woolen yarns. This difference in the thickness results in, not only that double amount of the white yarns is needed, but also in raised up pattern, which gives the belt a nice texture. Learn more about the mythology associated with Lielvārde’s belt, and see Laima interviewed when the latvian TV visited us in Aizpute. Laima swiftly prepared the correct set of white linen and colorful woolen yarns with a wooden apparatus available at the weaving studio. The apparatus is a wooden frame around which yarns can be spun. When setting up the backstrap loom, all the yarns are twisted around a rod (some from top, some from bottom). The next step is to lift the bottom yarns up in order to prepare the heddle. A diagram in Laima’s book shows how to set up the heddle. 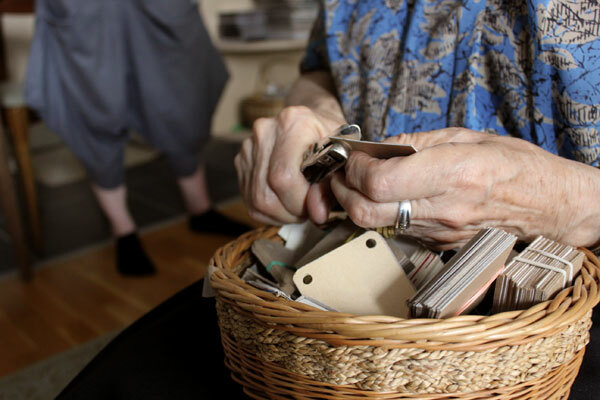 Laima used her wooden weaving knife, a pencil and thick household string to make the heddle. The string is placed under the bottom yarns and rotated around the pencil to make loops with which the yarns can be lifted during weaving. The knife is used for making evenly sized loops and it is removed when all the loops are ready. When the heddle is in place, the end of the belt that is attached around the waist is tied on a knot, and couple of wooden sticks are woven in the beginning of the belt to ensure proper weaving width. The other end of the bunch of yarns is attached to a table leg or other sturdy object. In the beginning of the belt an even texture is woven where every other yarn is lifted – at this point no pattern is visible. A white linen yarn is used as a weft (same color as the white warp yarns). Once the beginning part is done, pattern weaving starts. The pattern is created by lifting specific red yarns according to each row in the patten diagram. Keeping track of the belt pattern while weaving is important and requires full attention, as correcting mistakes is rather laborious. The weaving process is quite slow but eventually the Lielvarde’s belt pattern starts to emerge.